Dark Souls 3: Ashes of Ariandel has arrived, and the launch trailer would like to know if it could pencil you in for a mauling by its giant wolf any time soon. Or a throttling by its killer trees. Or an impaling by its oily Slendermen. Or… you get the idea. Feels like it's been about forever since Dark Souls 3 was released worldwide in April, doesn't it? 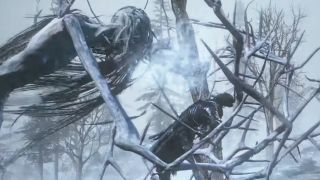 But Ashes of Ariandel is actually just the first of two DLC expansions planned for the game. It looks like the second will bring a definite end to the Dark Souls trilogy (and the Dark Souls 3 Season Pass) sometime next year.